Was Hurricane Katrina a phenomenon of weather warfare? Was it a test of Pentagon ‘capabilities’? Or is it the continuation of some other covert warfare of heretofore undisclosed factions? Katrina- a case of weather manipulation? Could Hurricane Katrina and other Catagory-5 hurricanes have been artificially created? The very idea that someone or some agency did this sounds utterly impossible and crazy to most people. Actually, it seems incredible to those who have never entertained such notions before. To others who know that the weather can be manipulated and the feds are up to no good, then the concept of unnatural weather disasters does not sound so fantastic. as he toured Alabama and Mississippi. - Secretary of Defense William Cohen, 1997 Counterterrorism Conference, Athens, Georgia. Scott Stevens has appeared on CNN with his idea of purposeful weather-manipulation. It is rare that concepts as unconventional as artificial weather or weather being used as a weapon make it on the television news and normal media. Scott ‘weather-wars’ Stevens praises the work of Tom Bearden. ‘His latest paper is absolutely essential in understanding how this scaler technology works, how long it has been active, who runs it and why finally what it is immediately capable of.’ Bearden describes what kinds of events are planned for the U.S. in the coming years. The following is an edited excerpt of Bearden’s paper dated 10/13/04. This date precedes the Sri Lankan Tsunami and the Hurricanes Katrina and Rita. Scott Stevens: As a television weatherman, I first met this information with skepticism, who wouldn’t?...almost completely rejecting the concept that weather-modification, outside of cloud-seeding, is possible. Additional clues kept creeping in…The endgame has arrived, just as the Powers That Be knew it would. My only question is whether it is later or earlier than their anticipation. This planet’s destiny is set…only the details have yet to occur…the possibility of regaining our sovereignty; that issue yet remains to be determined. If humanity only knew that this choice presently exists. The alarm bells are ringing; it is time to wake-up. ‘Some meteorologists contend there has been weather warfare. That is, they say, that there have been true man-made hurricanes, Ivan [the Terrible], 2004, and Katrina, 2005. And, that these storms were created by technology long known and directed to specific areas. Weather as a Force Multiplier: Owning the Weather in 2005. ‘In the U.S., weather-modification will likely become a part of national security policy with both domestic and international applications. Our government will pursue such a policy, depending on its interests, at various levels. Over the decades, weather-modification has developed to an ever advanced potential for controlling patterns and triggering specific events. In terms of earthquakes and hurricanes, they certainly have the means. Nikola Tesla, who invented or discovered radio, television, radar, neon light, alternating current, particle beams, among much else, was able to manipulate the weather in the early part of the 20th Century. [He could make rain, disperse clouds, etc.] He was well known to police in Greenwich Village responding to complaints from terrified neighbors about the lightning bolts originating from the top of his building. [Tesla also artificially created New York’s worse earthquake by a small resonator vibrating the steel support beam of his building. The accumulation of resonance once more caused damage and alerted the police]. The Illuminati plan is to create maximum chaos to instill maximum fear to create a sense of maximum dependency on authority. They want multi-leveled chaos to justify the imposition of marshal law, concentration camps, centralized dictatorship and the Orwellian global state in all its forms. 1997 Popular Mechanics – Modern Battles Will Be Won By Controlling The Weather. 2000 Weather.com - Controlling The Weather. Boston Globe: Don’t Like The Weather? Change It. particles via jet engine contrails to solve global warming). periods while normal contrails are only water vapor and disappear quickly). The 2004 Braziliam Hurricane Anomaly. 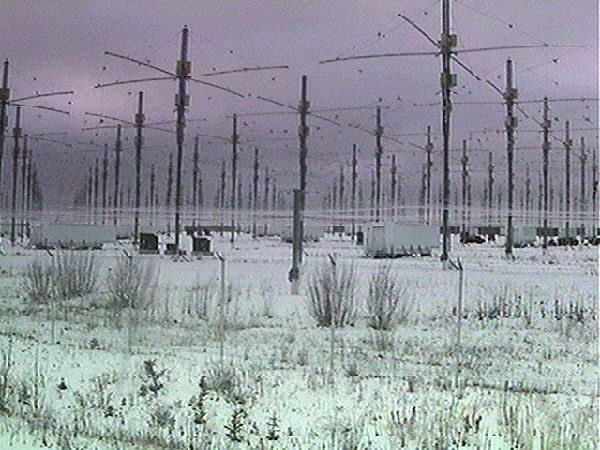 Angels Don’t Play This HAARP. Can Hurricanes Be Used as Weapons of Mass Destruction? If Not, Why Did the United Nations Outlaw Such Practices? What the masses of human beings all over the world have not been told is that it is possible to control and manipulate weather with a technology called ‘scaler energy.’ These energy weapons have other major capabilities that are even more dangerous than atomic weapons. Scaler Weapons could literally destroy the world! After Tesla died, the U.S. and Russia raced to confiscate all of Tesla’s papers. Within his writings and drawings was the secret of energy technology…unlimited power which could clearly be used to dominate the world if it wound up in the wrong hands. This amazing technology can also be used to heal people from many diseases, simply and for pennies. It also can be misused to induce disease in masses of people. Human beings are forced to continue to suffer from diseases that can be easily and successfully treated using Tesla’s technology. Scaler technology can also be used in an evil way and has the potential to cause huge amounts of damage by using the weather as a Weapon of Mass Destruction. This technology exists now. Laws have tried, in vain, to be passed that say Scaler Weapons cannot be used as a ‘weapon.’ Unfortunately, the U.S., Russia, Japan, etc. have been pursuing the use of advanced energy technology to control the weather. We may be dealing with several factors and a complex web of events that led to the U.S. losing one of its largest ports and a big chunk of its oil production. Also, there is the loss of thousands of lives, an estimated 100 billion dollars or more in damages and the complete loss of confidence in FEMA and the Red Cross agencies to respond to our people in time of dire need. Many researchers are focusing on the real possibility of Weather Warfare in conjunction with global warming. Men like Tom Bearden, Bob Fletcher, Stan Deyo and others have been warning us of this for a long time. Not only is it possible for major governments to possess the ability to create or alter and direct storms, hurricanes, earthquakes and other events…but many are studying the actions of Secret Societies and private groups to do the same. The research of Ed Haslam has revealed an astonishing example of either outright sabotage or gross incompetence at the height of the Katrina storm. The pumping stations were pumping out thousands of cubic feet per second from the rain soaked City into the canal which would normally carry the water into the lake. A massive blockage at the Hammond Bridge caused the water to back up and then blow out the levee (or it was blown with EXPLOSIVES) and flood the City. New Orleans is often flooded. For 100 years, the massive pumps have never failed to clear the water. Was this a monstrous act of sabotage, or a terrible act of incompetence? Will the Bush gang ever come clean or even ask the question of what happened? The search goes on for those who are striving for answers. Locals, Officials Suggested Levees were Intentionally Blown. Could the levees in New Orleans have been intentionally blown out in order to provide the justification for total FEMA federal takeover? The locals certainly think so, yet as usual, the mainstream media is barely picking up on this wave of opinion…(Katrina) was not the monster described. The storm passed through with relatively minor damage. Many locals have come forward to suggest the levees were breached on purpose by the authorities. This scenario is not so crazy as it sounds. The exact same thing has happened before and in the same city. 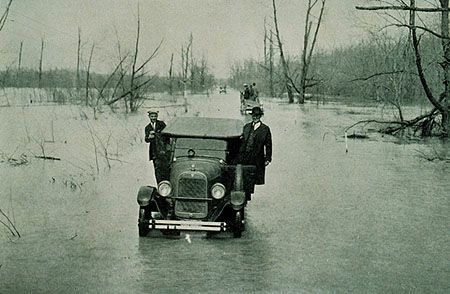 In 1927, the Mississippi River broke its banks in 145 places, depositing 30 feet of water over 27,000 squares miles of land. The great disaster changed American history. Blacks were driven northward. White business owners pressured the state to DYNAMITE the levees upstream, releasing torrents of water into black areas. Blacks were forced to work on flood relief at gunpoint, like slaves. The above information comes from the book ‘Rising Tide: The Great Mississippi Flood of 1927 and how it Changed America’ by John M. Barry. Levees were also intentionally blasted after Hurricane Betsy struck New Orleans in 1965. There were reports of many EXPLOSIONS HEARD in New Orleans. Officials say they were transformers blowing up. Total Information Analysis has reported a claim by intelligence expert Tom Heneghen that 25 earwitnesses cited explosions immediately BEFORE the levee breach. People should WAKE UP to what is happening all around them. What is truly going on behind the scenes? What is the REAL story that television, newspapers and the usual media will never expose? This writer wrote an article called ‘The Artificial World We Live In.’ Many things we assume are natural are, in truth, unnatural. Why did Rita, the most powerful storm ever recorded, occur immediately after Katrina? Maybe to give the public the false sense that these are merely natural events? See, this sort of thing happens all of the time; very normal. Even Hurricane Wilma seemed to make a 300 degree turn. It was, no doubt, directed to do so with a push of a button or the pull of a lever. Haven’t we seen this all before? After September 11, 2001, there was old man Bush and Bill Clinton appearing for the relief efforts. (We have a one-party system in this country, not 2). Here again, the past presidents are lined up because they care so damn much. Once again, there are concerts and (controlled) celebrities with their assistance after a terrible crisis. When are the people going to wake up to the truth? Huge amounts of money have been given to aid the victims of the hurricanes: much more than what was given after the Sri Lanka Tsunami; more than what was contributed for the 911 families or in the efforts to help with WW2. Never has there been such a flow of finance because of the Gulf hurricanes. The Red Cross and FEMA are not the wonderful organizations we are programmed to believe. Corruption is everywhere. It was very surprising to hear (on the news) that contributions and aid were NOT going to where they were supposed to go. On HAARP’s home page of its website, the first thing we read after the title is a memorial to 911. There is a flag and near it says: ‘We are united. We are resolved. We will not forget.’ Obviously, this is a clue to the evil behind it. Long ago, Nikola Tesla was intensely disturbed when they made an ‘electric chair’ out of his beautiful AC Current invention. ‘Radio Waves’ could be used to power the planet with wireless electricity. Instead of changing the world for the better and using Tesla patents to give us FREE ENERGY…governments have perverted radio waves to cause Weather Wars. Tesla would also be beyond revulsion to learn the feds have covertly twisted his concepts for the purpose of mass destruction. It is not outrageous to believe that last year’s tsunami was artificially made. Would the government of the United States actually have unleashed this incredibly destructive technology on its own citizens? The vast majority of people would not think so. Yet, most people are completely influenced by their televisions and newspapers. The media is like a commercial for the U.S. A commercial never criticizes or brings out the bad points of the manufacturer who is paying all the bills. This is the country that created the AIDS virus and distributed it among the ‘disposable’ people. This is the country that blew up its own federal building in Oklahoma City and blamed it on a bogus fertilizer bomb. This is the country that conned the world by crashing its own CIA, remote-controlled planes into the WTC to begin a war for oil. FYI: The planes that struck the towers were not the ones that took off that day and a missile (not a passenger plane) hit the Pentagon. Please keep an open mind and try to see through the federal lies. This writer told Scott Stevens, through e-mails, that it is not Russia or Japan doing all this horrible damage and creating these new Weather Wars. It is not just the United States that is to blame. The guilty parties are the ones who have ALWAYS caused needless chaos and wars: They are the Secret Societies. It is a global conspiracy; it is England and the Vatican; it is the richest and most powerful people on Earth behind the evil. This is the country that is a proud member of a Secret World Government. We remain under the fascist rule of Britain and the Vatican (Church and State). Learn of Secret Societies. Break from the media programming that affects all of us like a disease. Go to controversial conspiracy-type websites and learn. Open your eyes. Read books that question the status quo. Learn of the secrets that have been kept from you. Discover the truth; you never will over the television news and documentaries. Research alternative sources of information. One alternative source is to listen to ‘The Power Hour with Joyce and Dave.’ Look them up; they have many affiliates. Search through their archives on their website and LISTEN. You will hear a totally different point of view than the brainwashing we are so familiar with. I fully agree that there must be some aspect of this Administration that has known full well what is going on weather wise, and that none of these storms are natural in behavior or natural in origin. I would even lay odds that the levees were intentionally blown and that the Federal emergency response was deliberately slowed to create the element of chaos that the NWO needs so that we will give up our freedom of our own freewill. That is the only way the prison-planet will fully descend upon us is that we must give our power away to them willingly. If they can orchestrate the scenarios that bring the American population to that end result, you can damn well bet that those puppet masters will do these things; if the stripping of our freedoms is not accomplished by a weather disaster then it will be by flu or some other engineered terrorism.